Here's a simple holiday side dish. I never like cooked cranberries, and this couldn't be easier. All you need is a food processor. It's tart, sweet, bitter and zingy all at once. one piece fresh ginger about 1"x2"
In a food processor, put the fresh ginger and process to chop finely. Add quartered orange (check for stray seeds), cranberries and sugar. Process briefly until coarsely chopped. Some may like more sugar. Sometimes I'll add a finely chopped jalapeno for added kick. This sounds awesome. Forget Thanksgiving, I'm printing it out for my cookbook for every day use. Chop the onion and saute in the olive oil over low/medium heat until soft. Cut the garlic into slivers and add near the end of cooking. With rubber gloves on, shop the jalapeno pepper finely and add. Also chop or grate the galagal and ginger and add. Cook a couple of minutes longer just until everything starts to soften. Set aside. Bring a pot of water to boil and dunk the peaches one by one in just for 30 seconds each. Slip off the peels and chop the peaches into a large bowl, saving the juice and discarding the pits. Pour off the peach juice into a pot and bring to a boil with the brown sugar. Allow to boil until it is syrupy and thick. Remove from the burner and add lemon juice, sake, and vinegar. Toss the peaches with the flour and add the onion mixture. Chop the lime (including peel) finely and add. Pour the syrup mixture over and combine well. Spoon the chutney into jars and store in the refrigerator, or process. When Jack came down from the mountain one day, he ate two bowls of stew, a can of peaches, and two of Ennis's stone biscuits. So, I'm planning to serve my peach chutney mixed with a can of sliced peaches over shortcake, with ice cream on top during the holidays. This is the first thing I do before the holidays come around: make jelly, relish and various other condiments (in addition to some special liqueurs!!) I also have purchased a couple of jellies to use in making holiday dishes. One is red currant jelly. I use it in making a special sauce for meat. I also purchased quince jelly because it goes well with meat too. 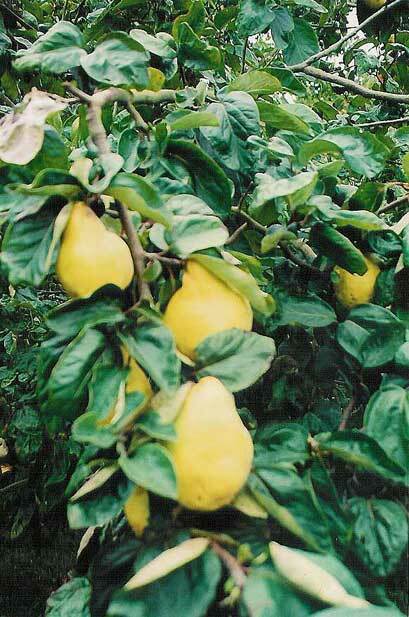 I've tried making quince preserves but they are increasingly difficult to find in the stores. Lovely picture, thanks! It must have been a wonderful day when you came upon the quinces. That looks really delicious. What do you serve it with? I serve this with meats, primarily the lamb that I serve nearly every Christmas, and it is also good with other full-flavored meats like goose, duck, turkey, beef, venison, elk, etc.